Ambitious as it may sound, but Delhi plans to run its buses on biogas. In collaboration with the Swedish government, the Union Ministry of New and Renewable Energy plans to set up a biogas plant inside Kesopur Sewage Treatment Plant (STP) complex in West Delhi. The plant will receive raw gas emitted by the STP and upgrade it so that it can be used to propel vehicles. The project, once completed, will earn the capital city the distinction of having the country’s first public transport fleet that runs on two types of clean fuel: biogas and compressed natural gas (CNG). Delhi already boasts running the world’s largest fleet of vehicles on CNG. Around 450,000 vehicles—this includes some 16,000 buses—in Delhi run on CNG, according to Indraprastha Gas Ltd, a Delhi government undertaking, which is the sole supplier of CNG in the capital. The genesis of the STP-biogas project lies in a bilateral agreement signed between Stockholm and Delhi in 2009 to share expertise and experiences to support sustainable energy systems in India, with special focus on biogas. Sweden is considered pioneer in biogas technology for heating, power generation and fuelling vehicles. More than 40 per cent of the biogas generated in the country is used to run vehicles. The aim of STP-biogas project is to create value from sludge, says Ludvig Lindstrom, international coordinator for the Swedish Energy Agency, a government body that promotes eco-friendly energy systems. During the primary treatment process of industrial and domestic effluents in an STP, after the semi-solid materials settle, the sludge enters into a digester. There it is fermented anaerobically. The process releases raw gas, which is usually discarded by flaring it up. But it contains 50 to 70 per cent methane, 30 to 50 per cent CO2 and traces of sulphur, nitrogen and oxygen. This is where the Swedish technology comes in. The biogas upgradation plant traps the energy-rich gases and puts them into use. The plant primarily consists of a loop where water and a chemical liquid, traded by the name of CApure, is circulated, says Lars-Evert Karlsson, sales manager with Purac puregas, a Swedish company that provides the technology. Before the raw gas enters into the loop, activated carbon present at the inlet absorbs sulphur present in it. Within the loop, CO2 binds with CApure, which then carries it to outside the plant. For releasing CO2, CApure needs to be heated. This stripped off CO2 can be used for industrial purposes like freezing and cooling, he says. The resulting 99 per cent methane is then compressed to be used as fuel. Another efficient feature of the technology is heat recovery. The upgradation plant has a heat exchanger, which absorbs the extra heat and pumps it back to the STP digester for heating sludge, says Karlsson. Since heat acts as a catalyst and speeds up the anaerobic reaction, the STP consumes 50 per cent less electricity. The compressed biogas is almost similar to CNG, the main constituent of which is methane. Thus it can be directly injected into CNG cylinders for vehicular use or fed into CNG-fuelled power grid. It can be mixed with CNG and used. Is the technology tested enough? Mikael Kullman, counsellor of climate change and energy at Swedish Embassy, New Delhi, says similar installations are operational in Sweden, Norway and Germany. There the technology helps the countries reduce their carbon emissions. The solution also creates a model for cost savings in the municipal economy, Kullman says. If all goes according to the plan, the plant should be operational by the first quarter of 2013. The Keshopur STP was selected for the project because it is located close to a CNG-filling station and a CNG-fuelled power grid, says V S Thind, chief engineer at the Delhi Jal Board. With 10 per cent stake holding in the project, the city water authority would provide raw gas and land for setting up the biogas plant. The STP, functioning partially at present, can treat 72 million litres of wastewater per day. 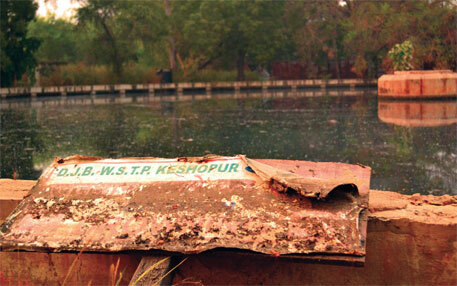 Delhi Jal Board is currently renovating it to make it fully functional as part of the Yamuna Action Plan. At full capacity, the STP will emit enough raw gas for the biogas plant to generate around 25,000 cubic metres of compressed biogas per day. This is enough to fuel 120 buses. Indraprastha Gas Ltd and K G Renewable Energy Private Limited will market the gas. They are also involved in implementation of the project. The Union Ministry of New and Renewable Energy is yet to work out the pricing mechanism. Though biogas has long been used in the country, it is largely confined to rural areas. It has never been priced as people produce biogas in their backyard and use it for cooking or electrification. “We are working on these problem,” says Anil K Dhussa, director at the ministry. It is also not clear how biogas will compete with other fuels like CNG and diesel which are highly subsidised. Lindstrom suggests that biogas should be priced less than other fuels to promote it even if it requires the government to subsidise it. “India imports a large amount of liquefied natural gas (LNG), converts it into gas and then subsidises it.” Last year India imported 8.83 million tonnes of LNG, worth Rs 9,344 crore. For biogas, India just needs to tap its huge piles of waste. There is no mention of fuel efficiency and effect of the same on Bus engine performance/life,in the article. Can some one throw light on this aspect? Dear Milind, as already mentioned by another replier, the quality of the CBG produced in the project is similar to CNG. The technology introduced will ensure that potentially harming substances - such as H2S - are efficiently removed together with the removal of CO2 and water. It can even be considered as a better quality as the methane content may reach almost 100% (depending of how the equipment is set/adjusted) compared with the CNG often used in India having a methane content of 90-92%. Thus the CBG can be mixed with CNG both in the grid as well as in the vehicle fuel tanks and no specific adaptation of the vehicle engines are required. Why we depend on others, why we see what others are doing and do the same. We are super powerful methane nation with full of selfish and waste people who do not want to change. and finaly,we become slaves in this world by buying methane from them. What a shame. Let's stop it, why not India become biggest producer and exporter of methane?